Cabbage Moong Dal Curry is another one of those poriyals that need a technique in getting it right. Boiled cabbage does not smell very appetizing, so the art is avoid the smell and make the vegetable taste delicious. And adding Yellow moong dal not only adds protein, but makes it very tasty as well. Cabbage is one of those staple vegetables that get bought every week. When there is no plan to prepare other vegetables, it invariably becomes a cabbage time. I love kootu with cabbage, other masala stir fries. However the best one to enjoy the taste of cabbage comes with this dish. Cooking the moong dal to the right consistency is very important. I know many would not prefer to relish the cabbage in general, though I must say that they will change when they get to taste this stir fry. This not only makes a great side dish for rice, you can serve it with rotis as well. Wash and soak the moong dal for 10 mins. Wash and chop the cabbage finely. In a pan with just enough water, bring the cabbage to boil. When the cabbage is almost half done, simmer and add the drained moong dal. Cook for 10 mins. Switch off the fire when done. In a non stick pan, heat with oil, temper with mustard seeds, Urad dal, curry leaves, cumin seeds, slit green chilies. Sauté for couple of mins. Then add the cooked cabbage and mix everything well. Cook for 2 -3 mins, finally season with fresh grated coconut. 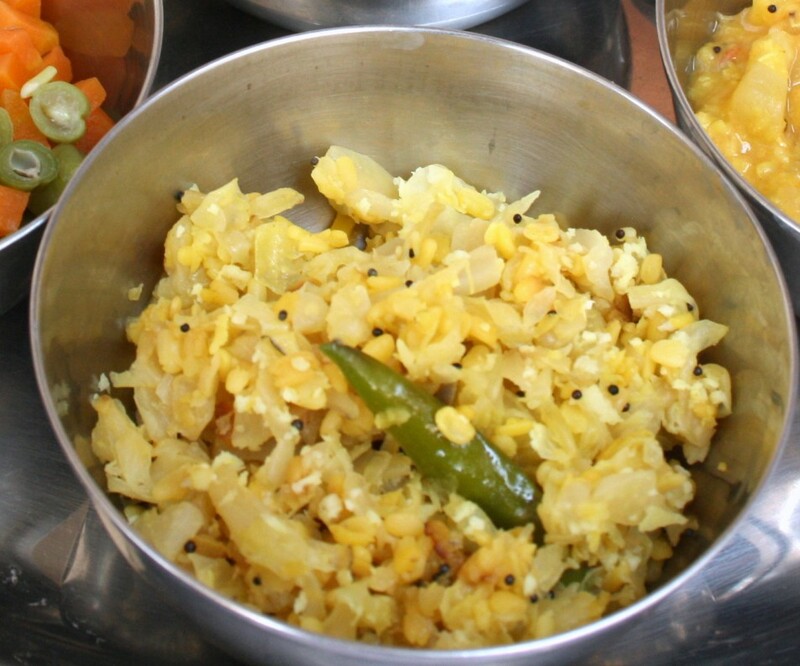 Serve on the side with Rice and Sambar. I do this poriyal quite often, cooking cabbage partially before making the poriyal sounds interesting, will try this next time. I just love cabbage…Looks delicious!!! True if the cabbage is not cooked properly it lends that raw flavor, which no one likes..we normally dont add any daals to veggies..but I think I should start now..a diff menu will be appreciated. we can taste it mostly in marriage function..
this one is the best combination with any pulusu for me. when ever i make pulusu i make this as a side dish for sure. yes i agree with you cooking cabbage in a perfect way is an art delicious curry Valli. best dishes are made with basic and simple ingredients..i am not big fan of cabbage but like it often when made this way…. Moong dal is a nice edition to the poriyal. I have eaten chana dal cabbage combination but never tried moong dal. It looks good though. Delicious stir fry. Love this with Sambhar rice.. I love cabbage curry and with moong dal is something new to me. I need to try it. Looks so tempting Valli. Great side-dish! Lovely with Yogurt rice and Kaara Kuzhambhu! Good one. I grew up eating this version of cabbage curry. I prepared this yesterday.. such a simple yet tasty dish! I'm always on the lookout to make cabbage more appealing..Thanks for sharing this!